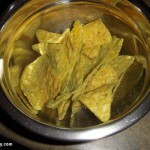 OK, so talk about a random bag of chips. From the base of Mt. 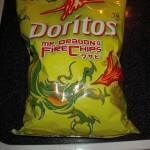 Fuji, this dragon, a symbol of luck, had brought DORITOS one of Japan’s most intense flavors. And with only one bite the enigma was solved, and all the clues then made sense. So what do you think the flavor is? Give up? As kind of an interesting side note on the ingredients, the bag lists both horseradish and wasabi as ingredients. And you can really taste both flavors on the chip, the horseradish more so then the wasabi. But I have a feeling like they added in the horseradish to keep the costs down, as well as the intense heat down from just “100% real wasabi”. 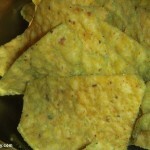 So I’m not going to fault them for going down this road, since 100% wasabi would have been unbearable on these chips. Overall these chips are a winner in my book.